Actor Gailard Sartain, who calls Tulsa home even though he lives in Los Angeles, cracks a joke Friday after unveiling the artwork he created for the Mayfest 2001 poster. Actor and artist Gailard Sartain relies on his Tulsa memories for inspiration. 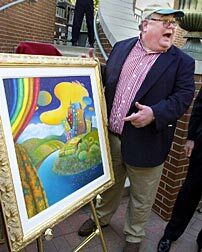 The artwork for Mayfest 2001's poster, unveiled at a Friday ceremony, is as colorful and wacky as its creator, Gailard Sartain -- better known to many Tulsans as "Mazeppa," a late- night TV legend during the '70s. "I wanted it to have vibrant colors, so I just let myself go with it," Sartain said. "I used all of my memories to try to capture a Tulsa flavor." The original "RiverView" artwork, done with acrylic paint, shows a turquoise river making its way past green fields with trees and flowers into Tulsa's downtown, where each building is wavy and a different color. In the dark blue, starry sky, there is a layer of pillowy clouds and an irregular-shaped, yellow sun. And in the upper left-hand corner is a rainbow pulled back against the edge of the painting like a drape. "I'm so happy with the artwork," said festival chairman Michael Patton, who pursued Sartain as the artist because he used to be a fan of "Mazeppa." "Mayfest is fun, and that's what Gailard Sartain represents to me -- fun," Patton said. "He was the thing to watch on TV when I was a kid." Back in 1970, Sartain was a cameraman at KOTV in Tulsa when he got the idea of creating comedy skits to run between late-night horror movies and musicals. It turned into "The Uncanny Film Festival and Camp Meeting," and Sartain brought a zany, off-beat humor to the character of Dr. Mazeppa. Actor and Tulsa native Gary Busey also performed in the comedy skits before he made it big. The show was aired until 1973, when Sartain joined the cast of TV's "Hee Haw." From there, he has gone on to appear in more than 40 movies, including "Fried Green Tomatoes," "Mississippi Burning," and "The Jerk." Sartain and his wife, Mary Jo, live in Los Angeles but own a house in Tulsa and come back every year. His two daughters are teachers in the area. "This is home to us," he said. "We love Tulsa. That's why it means so much to me to be able to do something like this. I'm better known for my acting gigs, but this is recognition of my artistic side. I was proud to do it." Sartain will sign posters on the opening day of Mayfest, which runs May 17-20 downtown. Posters will cost $15 unsigned and $25 signed. Copyright © 2001, World Publishing Co. All rights reserved.